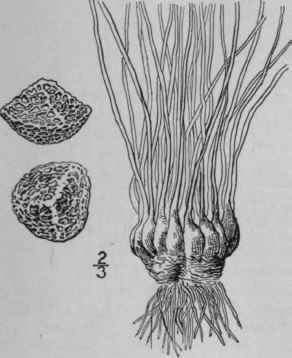 Isoetes saccharata Engelm. in A. Gray, Man. Ed. 5, 676. Amphibious or uliginous with a flat depressed trunk. Leaves 10-30, green, pale at the base, spreading, 2'-3' long, quadrangular, bearing numerous stomata; sporange oblong, unspotted, with a narrow velum covering only one-fourth or one-third of its surface; peripheral bast-bundles wanting; ligule triangular, rather short; macrospores 420-510 μ in diameter, with very minute distinct or rarely confluent warts as if sprinkled with grains of sugar; microspores sparingly papillose, 22-30 μ long. In mud overflowed by the tides, eastern Maryland and District of Columbia. 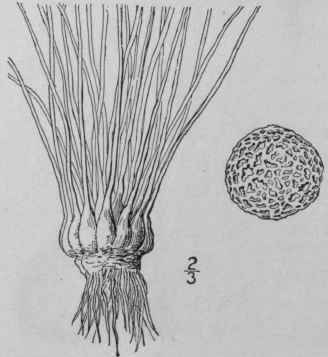 Isoetes riparia Engelm. ; A. Br. Flora, 29: 178. 1846. Amphibious or uliginous, usually emersed when mature; leaves 10-30, green, rather rigid, 4'-8' long, quadrangular, bearing numerous stomata; peripheral bast-bundles wanting; ligule rather short, triangular; sporange mostly oblong, distinctly spotted with groups of brown cells, one-fourth to three-fourths covered with the velum; macrospores 450-756 μ in diameter, marked with distinct or anastomosing jagged crests or somewhat reticulate on the lower side; microspores 28-32 μ long, more or less tuberculate. Borders of the lower Delaware River. 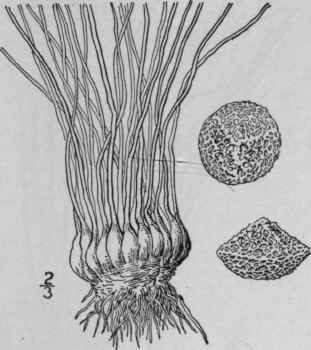 Isoetes foveolata A. A. Eaton; Dodge, Ferns and Fern Allies of New Eng. 38. 1896. 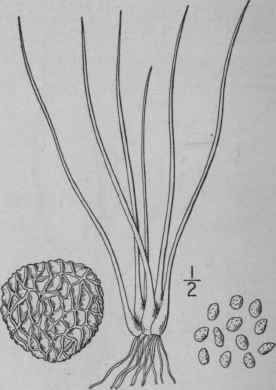 Isoetes foveolata pleurospora A. A. Eaton, Rhodora 5: 280. 1903. Amphibious from a bilobed or rarely trilobed base. Leaves 15-70, stout, 2'-6' long, pinkish even when dry, or rarely dark green; stomata scattered, found only near the tips; no peripheral bast-bundles; monoicous or becoming dioicous; velum covering 1/4 or 1/3 of the sporange; ligule round-ovate; sporanges thickly sprinkled with dark cells which are often collected in groups; macrospores 380-560 μ. covered beneath with very thick-walled reticulations, the openings appearing like little pits; reticulations elongate on the upper surface of the spore; microspores dark brown, 22-35 μ long, densely reticulate and usually slightly papillose. In muddy banks, New Hampshire, Massachusetts and Connecticut. Isoetes Eatoni Dodge, Ferns and Fern Allies of New Eng. 39. 1896. Amphibious from a large trunk 1/2- 1 1/4' in diameter. Leaves of the submerged plant 30-200, varying in length up to 28', marked with an elevated ridge on the ventral side; leaves of the emersed plant shorter, 3-6; stomata abundant; peripheral bast-bundles irregular in occurrence or often wanting; velum covering 1/4 of the sporange, polygamous; sporanges large, 0.4' by 0.15', pale spotted; macrospores small, 300-450 μ in diameter, marked with convolute labyrinthine ridges and cristate on the angles of the inner face; microspores 25-30 μ in diameter, minutely tuberculate. In mud flats, New Hampshire to New Jersey.